Trouble identifying “why” you feel sad, angry, tired, etc. Choose one of your go-to habits for coping with stress and get curious about it. Every time you see yourself doing it or feeling the compulsion, ask yourself why that might be happening and observe does this actually make me feel how I want to feel? Am I really getting what I’m looking for? Develop a routine or ritual to go through when it’s been a long day – something that will help you feel the way you really want to feel. Read more about this step here. As we enter the holiday season, this is a great reminder to keep wellness top of mind! Thanks for sharing. Thanks, Jennifer! I’m brainstorming ways to let the holidays be a supplement to my wellness rather than a detractor this year – the pull toward frenzied work and worry is so strong as we near the end of the year, but I honestly believe that even if all the work isn’t done, it is better to enter a new year WELL than accomplished yet burnt out. I find I need to spot the signs early, as burnout can escalate quickly. Good advice! Agreed. 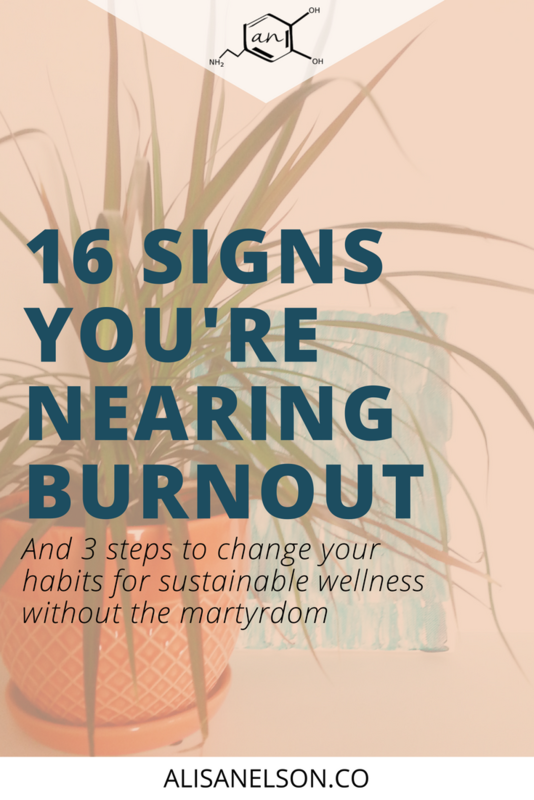 When we start to get familiar with our personal signs of burnout, then we can get even deeper and see what comes first so we can respond quicker. Between family, friends, and work – there is no time for the burnout! Especially since it can take weeks >> months to get back to optimum performance. As much as I love the holiday season coming up, it sometimes can be a very stressful time of year. These are great tips to help avoid burnout. Thanks, Bree! What parts feel the most stressful? Is there a way for you to align those things more to your strengths and what you enjoy? When we seek more attuned connection between our actions and who we are, we will naturally experience greater wellness even when things are busy or deadlines are looming. Can I challenge you to take one thing off your plate in place of something that really helps you celebrate life?